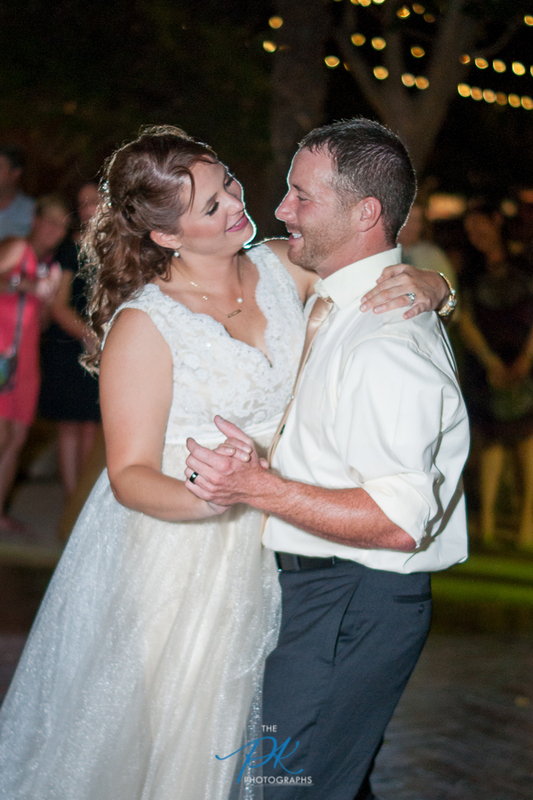 Denise and Brian on their wedding day at Gardens at Old Town Helotes, in Texas. Denise and Brian are one of those couples whose wedding you wish you could photograph again, and again, and again. While their wedding wasn't what I would call small, it felt small because it was so intimate. They chose to hold their wedding at The Gardens at Old Town Helotes. This bride and groom choose to do a first look after getting ready, which allowed for beautiful and private photographs of a very emotional moment. They weren't distracted by how their ceremony was decorated, all the guests in attendance, and we were able to take romantic Bride and Groom portraits during daylight. In addition to doing a first look, this couple chose to have a cocktail hour before their ceremony, instead of after. They had so much more time to socialize with their guests, there were no last-minute guests arriving after the ceremony had already started, and the entire ceremony had a more cozy feeling due to everyone having time to socialize and get to know each other a little bit before hand. 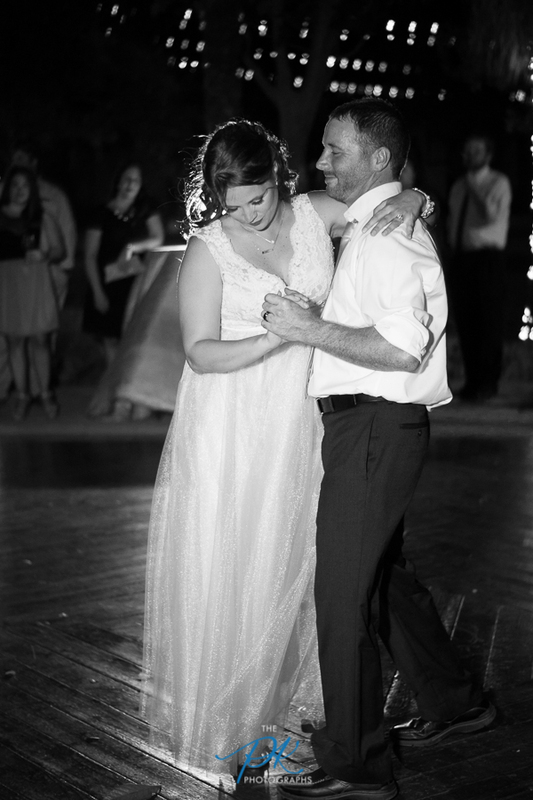 I highly recommend considering a timeline that is similar to Denise and Brian's if you're wanting to get the most out of your wedding photographer, and to have an even more intimate atmosphere at your wedding. But back to the actual wedding day! Denise gave Brian some great "cold feet" gifts that were hilarious to watch him unwrap, including a pair of socks with their wedding date on it, a personalized bottle of Fireball whiskey, and a book titled "Don'ts for Husbands". 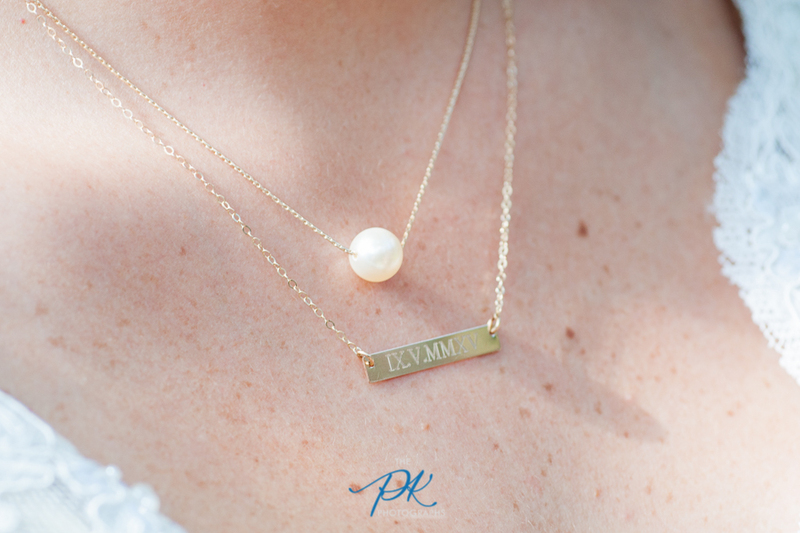 Adding to the close and intimate feeling of the day, Denise's mother hand-made her wedding dress and her necklace was custom engraved with their wedding date in Roman numerals, and Denise had personalized handkerchiefs made for her sister, the maid-of-honor, and her mother. As guests arrived at their cocktail hour they signed a custom-made jersey, a unique guestbook alternative. Denise and Brian socialized with their guests until it was time for the ceremony. Unlike the majority of weddings, this bride and groom choose to walk up the aisle together to where Brian's step-father was waiting to officiate the ceremony. Having a personal relation to the couple as the officiant, and one with a great sense of humor, like Brian and Denise choose, made for a ceremony with lots of laughter and jokes at Brian's expense. During the formal family portraits following the ceremony everyone had some fun with fake mustaches while Brian and Denise couldn't keep from expressing their love. Meanwhile, inside the reception area, all eyes were on the pie table until the Bride and Groom walked in. Ten different pies? Yes, please. And the gold deer cake, er, pie toppers were perfect! After dinner the best man and maid of honor gave hilarious toasts that had everyone laughing, and then all the guests headed outside to the dance floor to watch the bride and groom's first dance, and let loose themselves. Such a beautiful end to a day full of love and support. Denise's bridal jewelry was all gold with beautiful pearls. One of her necklaces was engraved with their wedding date. Denise's gifts to her future husband before the ceremony were hilarious, including this personalized bottle of Fireball and a pair of socks in case he had cold feet. Denise gave personalized handkerchiefs to her mother and sister. 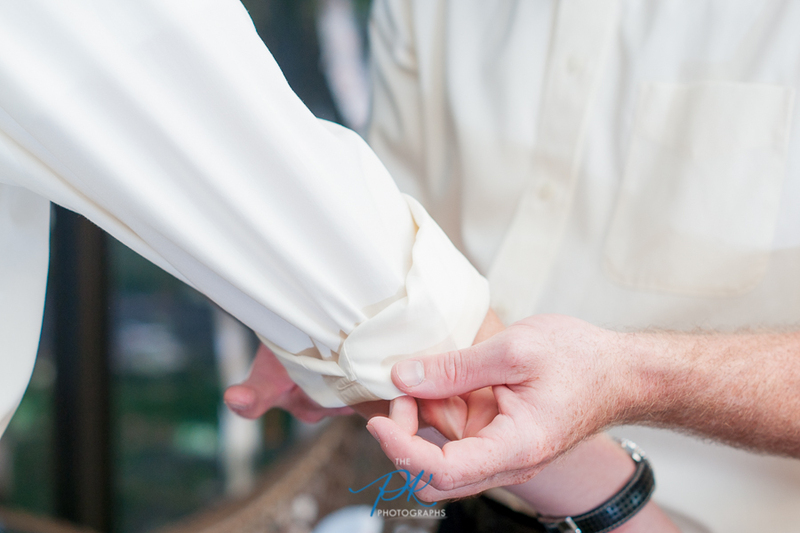 Brian and his best man went with no jackets and sleeves rolled up to beat the Texas October wedding heat. 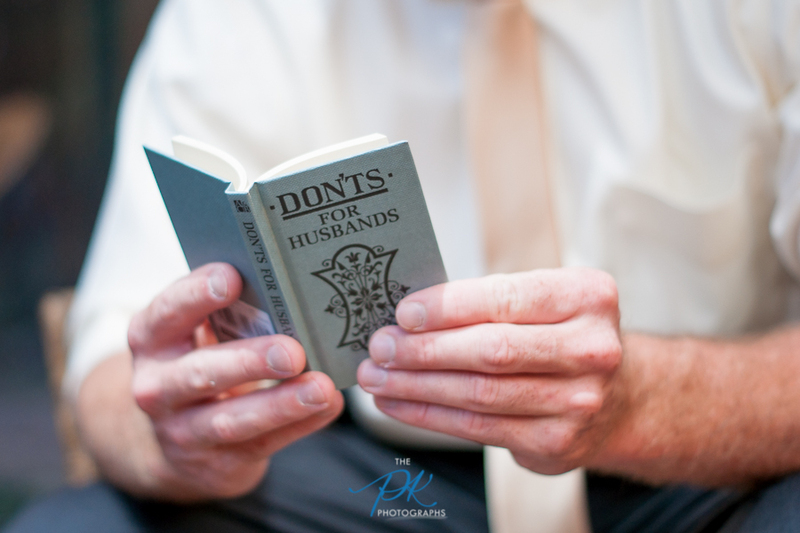 Denise also gave Brian this book, "Don'ts for Husbands", which he cracked open. Brian was so nervous waiting to see his bride during their first look. Denise was so excited to see Brian's reaction during their first look. 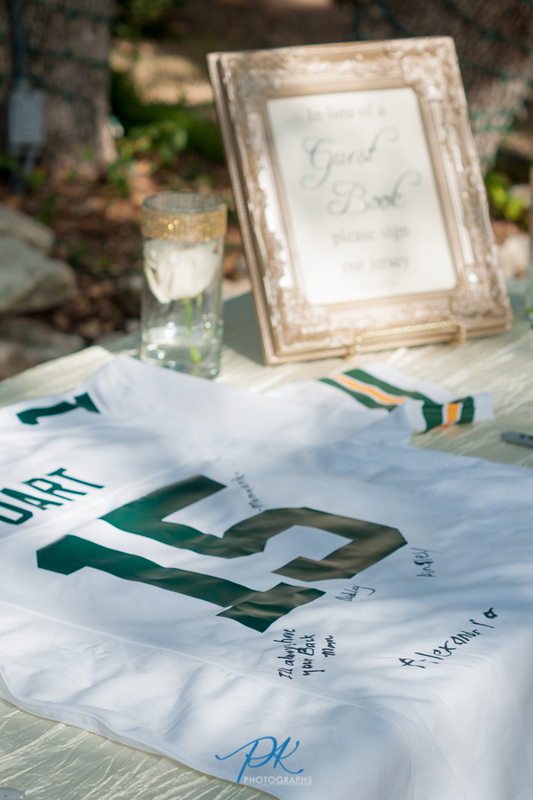 Instead of a wedding guestbook, Denise and Brian had guests sign a custom jersey. The before-ceremony cocktail hour gave the bride and groom ample time to relax and chat with all of their guests. Gardens at Old Town Helotes was such a lush, beautiful venue for this wedding. The aisle was decorated in all gold and white. 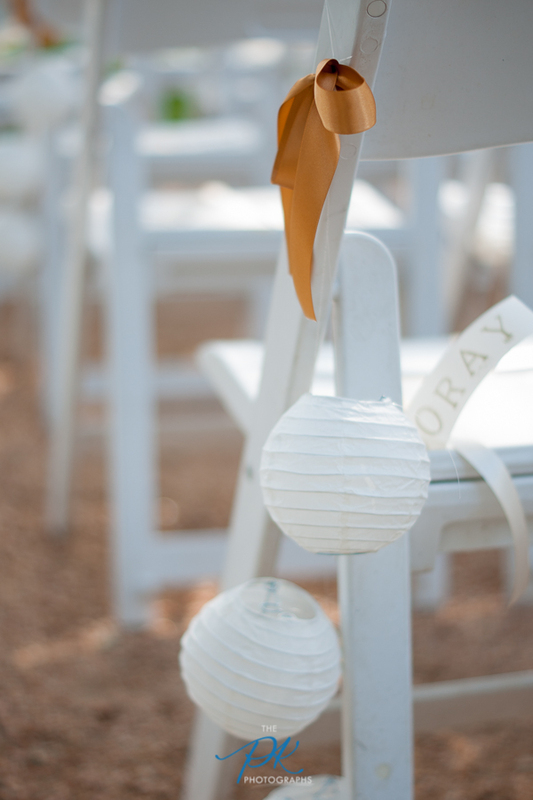 The ceremony area at Gardens at Old Town Helotes was perfectly decorated in all gold and white. Denise and Brian walked up the aisle together at the start of their wedding ceremony. 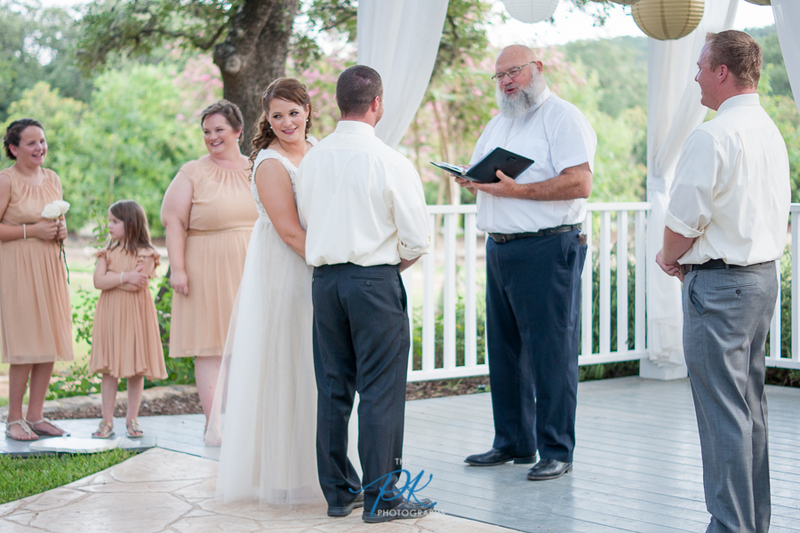 Denise and Brian's wedding ceremony at Gardens at Old Town Helotes. Denise and Brian's kiss at their wedding ceremony at Gardens at Old Town Helotes. All the guests gathered around during their first kiss at the end of their wedding ceremony. 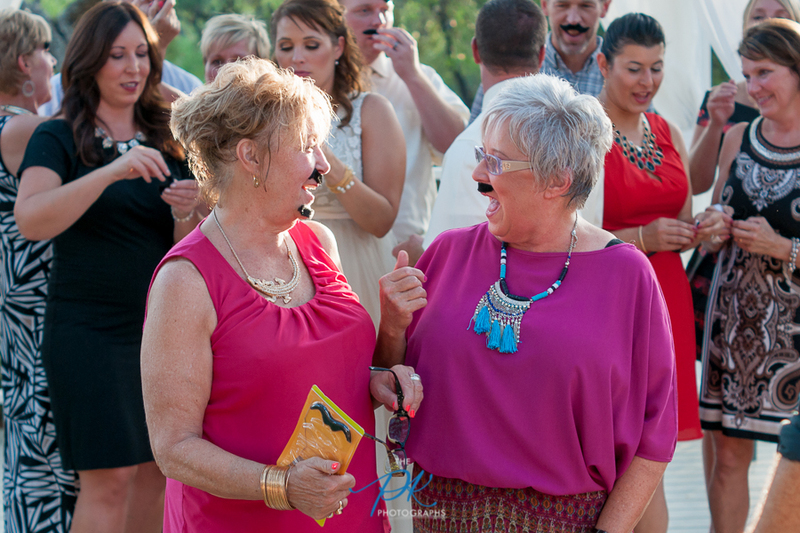 The formal photographs were too much fun with fake mustaches for everyone! Not even everyone's getting their fake mustaches could distract Brian and Denise from celebrating their marriage. The pie table set up in the reception hall had 10 different pies. A Texas wedding pie table just wouldn't be complete without Southern Pecan pie! Everything was set up for the pie table. Napkins were set up beautifully with handmade napkin rings. 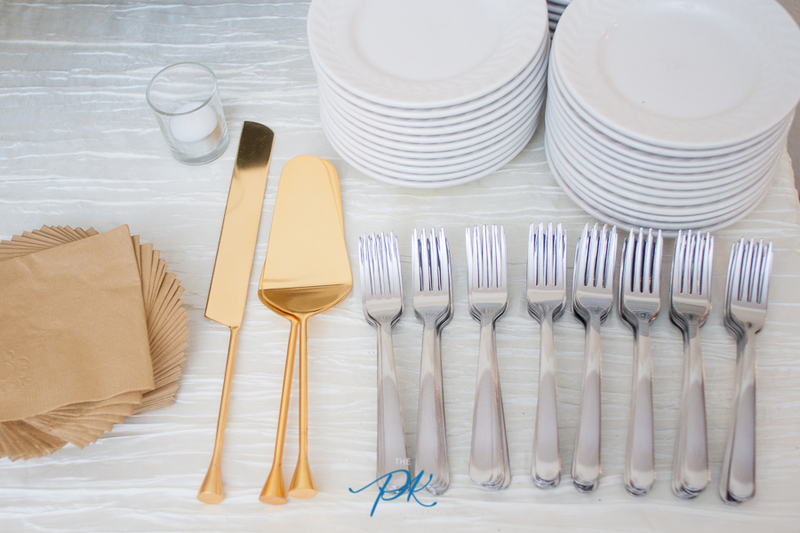 The wedding reception tables were ready for guests. The best man's toast had everyone cracking up! 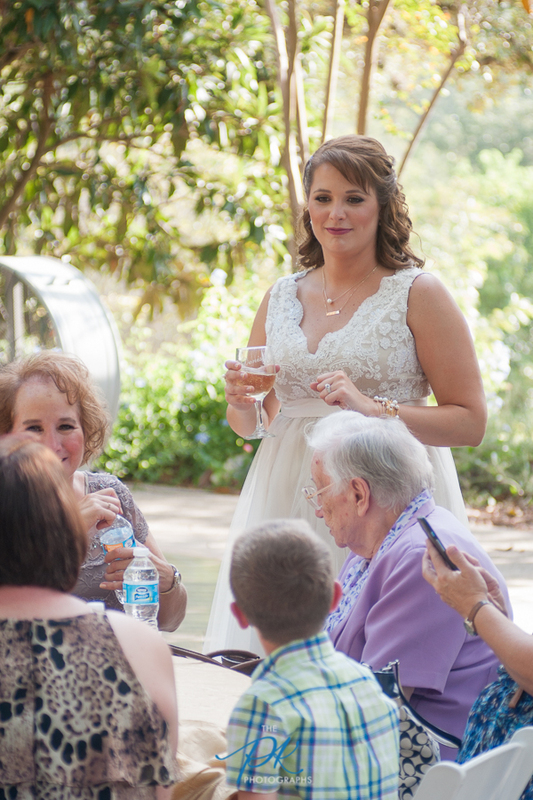 The maid of honor's toast had everyone cracking up! Denise danced the night away under the night sky. All the guests on the dance floor let loose for the rest of the night, celebrating Denise and Brian's marriage.